In this year’s Arrowverse crossover, the gang is getting back together to fight off their evil doppelgangers from Earth-X. During the “Crisis on Earth-X” throwdown, characters from across Supergirl, The Flash, DC’s Legends of Tomorrow and Arrow will join forces to overcome this interdimensional threat. If you’ve been keeping up with these shows, you’ll realize that’s a lot of heroes — somewhere around 21, in fact. During a set visit, Legends of Tomorrow star Brandon Routh — who plays Ray “The Atom” Palmer — discussed his involvement in the crossover and how they managed to squeeze everyone onto the bridge of the Waverider. “Ray was not invited to the wedding — which I think has less to do with Ray and more to do with too many people at the wedding that they have to deal with and cover and give air time to. That’s what I like to tell myself, anyway!” he shared. The scene in question can be seen in the photo above, which features a whopping 18 of our heroes. This includes newcomers The Ray and Citizen Cold, who hail from other Earths. 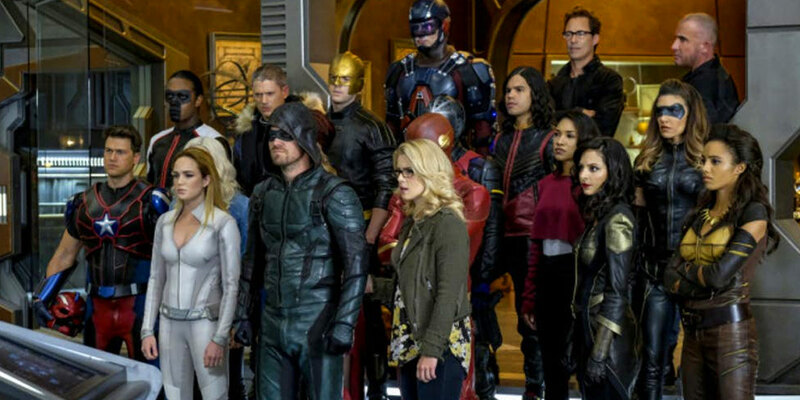 Of course, the Waverider scene is just one of many that will find these Arrowverse characters in league with one another; other trailers have shown several big group shots, from big fight sequences to a dramatic walk under an overpass. In fact, according to The Flash star Grant Gustin, “there’s more people than ever included, some of the biggest sequences you’ll see with the most superheroes we’ve ever seen together at any given time” — and the photos seem to prove that! This year’s four-part crossover “Crisis on Earth-X” will air across two nights, beginning Monday, Nov. 27 with Supergirl and Arrow (on a special night for one week only) and concluding Tuesday, Nov. 28 with The Flash and Legends of Tomorrow.